Allison Pittman is an award winning author of numerous books, all historical, and all set during different time periods. I first got to know her when we both attended a writer's retreat, and she offered to pick me up at the airport. We had a great time getting to know each other, and from our conversations, I couldn't wait to read one of her books. 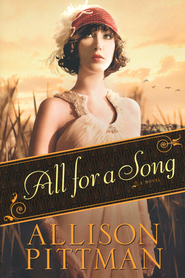 All for a Song is set during the Roaring Twenties, when a small-town southern girl finds herself tempted as she travels with Aimee Semple McPherson. She's never left her small spot on the map, and as the world opens up for her, she has to decide what role her faith plays in her life. She's always done what's expected of her, and now as her wedding is barreling down on her, she wonders if she'll ever get to live. This story is beautifully written in a way that drew me deep into its pages. The characters are rich and varied, and I felt transported to a time period I don't know much about, but enjoyed visiting. If you have never read one of Allison's books, please allow yourself a treat and settle in for a read that will leave your mind satisfied and your soul touched.